Eddy's Toyota of Wichita, a division of Brandon Steven Motors, owned by Brandon Steven, serving Hutchinson and Emporia, is dedicated to bringing you the absolute best in customer service and top quality vehicles--and it shows. We have a long history of winning awards that continues through to today. Eddy's Toyota of Wichita is proud to announce that we've won the 2014 Toyota President's Award. This award is given only to dealerships that excel in customer service every step of the way; and Eddy's Toyota of Wichita certainly fits the bill! No matter what you're looking for, we're more than happy to help you out: from our sales team that can help you find a new Toyota or pre-owned vehicle to our factory certified service technicians to our parts specialists, everybody here is dedicated to you. 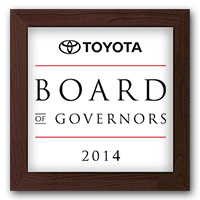 Eddy's Toyota of Wichita is also proud to have received the 2014 Toyota Board of Governors Award, which is given to dealers with excellent sales volume. Come to Eddy's Toyota of Wichita to experience our top-quality customer service--an experience like this is worth the drive from Hays or Salina! You can call us at (316) 618-2332, or just stop by 7333 E Kellogg Drive, Wichita, KS 67207; we're open from 9 am until 9pm from Monday through Saturday, and from 11 am until 7 pm on Sundays. We look forward to giving you an award-winning experience here at Eddy's Toyota of Wichita!